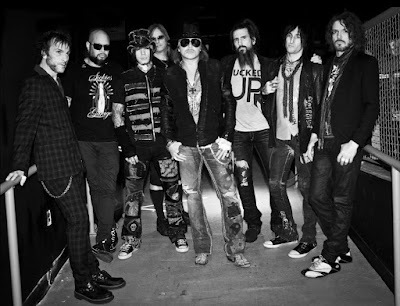 MetalRockNews: Guns N' Roses drummer Frank Ferrer about Axl Rose: " Is one of the greatest living rock stars in the history of music"
Guns N' Roses drummer Frank Ferrer about Axl Rose: " Is one of the greatest living rock stars in the history of music"
Guns N' Roses drummer Frank Ferrer was interviewed by rock journalist Mitch Lafon, you can read some excerpts below. About whether he is still a member of Guns N' Roses: "I am a member of Guns. Axl Rose and I text all the time. But, yeah, I am a member of Guns, and Guns still exists." About Guns N' Roses' current status as a band: "Well, the best way to answer that is to say that Guns has a future. Guns definitely has a lot of moving parts, and there's a lot of things in the works. And once we're ready to announce something, the whole world will know. But everything is moving forward." About when Guns N' Roses will play out again: "As of right now, we don't have anything booked, but I'm hearing rumors that there probably might be stuff towards the end of this year or beginning of next year, but there's nothing booked as of yet." About why it took Axl Rose so long to release Guns N' Roses' last album, "Chinese Democracy": "I guess the only thing I can say is he wasn't ready, he just wasn't ready, to put it out. He didn't feel like it was completely done. It’s his baby, and he wanted it to be perfect. Still today, even today, he wants everything to come off just right. And that's a lot of pressure to put on yourself. And he deals with it in his own way. He is probably one of the greatest living rock stars in the history of music, and they're becoming rare, as you know. I mean, think of a rock star in the last fifteen years that's popped up. You can't think of anybody. Everybody's still… Nine Inch Nails is still headlining festivals, and Soundgarden, and Alice In Chains. It's, like, there's nobody out there. And Axl puts that pressure on himself. That's a lot of pressure. He just wants it to be right. That's the only thing I can say: he wants everything to be just right. That's who he is. That's what every artist is. They're perfectionists in their own right. Very rarely… For every one great song you hear, they've written sixty songs that probably are great, but they don't feel are great. That's the way they think. He has a lot of pressure on him."